Ajax v Juventus saw plenty of trouble ahead of the match with 120 Juve fans arrested for causing trouble and were found knives, screwdrivers, sticks and pepper spray in searches on fans in Amsterdam city centre. Inside Amsterdam’s Johan Cruijff ArenA the fire was contained onto the pitch where Ajax and Juve clashed in what was a fascinating encounter. It took just two minutes for either side to create a chance with Juventus’s forward Federico Bernadeschi unleashing a shot from 20 yards that graced the top of André Onana’s goal. Juventus may have had the first chance, but the opening stage was all about Ajax pressing high up the pitch showing the sort of tenacity that they displayed over two legs against Real Madrid. Ajax had the better start dominating the play. But Juve’s defence held steadfast, and it took until the 19′ minute for keeper Wojciech Szczesny to have to show his skills brilliantly tipping curled effort by Hakim Ziyech over the crossbar. Six minutes later Ajax should have scored. Dusan Tadić brilliantly kept the ball moving through midfield found David Neres, who drifted forward, spotted Danny van de Beek but his shot from the edge agonisingly close missed the far post. It was a typical attacking move at this stage, Ajax controlled the centre and managed to play forward whenever receiving an opportunity. What about Juve? When they did make their way forward, their attacks were quickly smouldered. Once again Bernadeschi came the closest in the 29′ minute, but Frenkie de Jong stayed with the forward and tackled the ball off the Italian forward’s foot at the last minute. Bernadeschi was the most prolific Juve player at this early stage and saw a shot go just wide in the 36′ minute. Bernadeschi was kept off the scoresheet, but Juve have a world class striker in Cristiano Ronaldo. Cristiano has been struggling with injuries the last two weeks and was invisible for the entire 45 minutes, but he needed just one touch to open the scoring, briefly left unmarked at the centre of the box he nodded home a cross by João Concalo in the 45′ minute. Ajax, however, have their very own number 7 superstar forward in David Neres. 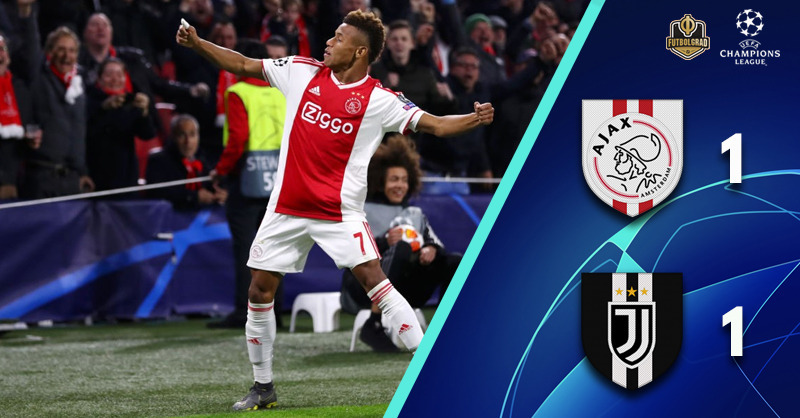 The Brazilian took just a few seconds in the second half to get Ajax on the board equalising with a terrific curled effort to make it 1-1 almost straight off the second half kick off. The 22-year-old Brazilian was all over Juve to start the second half. Drifting from the wing to the centre and back David Neres was a thorn in Juve’s defence throughout the opening 15 minutes of the second interval. Yet somehow Juve managed to keep David Neres and Ajax from scoring, or even get another proper sniff at goal. In fact, the Italians became more secure as the game progressed in the second half. Ajax, in the meantime, became almost desperate to find a second goal to take to Turin. Jurgen Ekkelenberg, the 19-year-old had come on just moments before, seemed to have the winner in the 83′ minute. Receiving the ball on the edge of the box with his back to the goal Ekkelenberg turned and unleashed a shot but Szczesny was there and kept the ball out. One minute later Douglas Costa almost found the lead for Juve, dancing through Ajax’s defence the Brazilian unleashed a shot from inside the box but hit the outside post instead. The final chance of the game fell to Ajax. But in the 90′ minute Dusan Tadić, despite having acres of space, put a shot from inside the box wide of the goal. It would have been an all-important goal that would have given Ajax the advantage going into the second leg, but instead, Juve got away with the result that might just favour them. David Neres was the man of the match. There was plenty of talk about the 22-year-old Brazilian winger ahead of the match with reports emerging that the forward could be on his way to the likes of Borussia Dortmund, Liverpool, Bayern or Paris Saint-Germain. Just before halftime, Cristiano Ronaldo had scored for Juve, but Ajax’s number 7 highlighted that he is one of the brightest talents in Europe at the moment dancing through defence he scored a real beauty to equalise the score and then remained one of the most dangerous players on the pitch. Italian football has a violence problem. Ahead of the game 120 Juve fans (some reports suggested 119) were arrested and found to carry knives and other weapons. While there have also been reports about Dutch fans being arrested, it is the Italian fans overall that once again stood out. The violence overshadowed what, in general, was a fantastic match. Cristiano Ronaldo is now the joint-top goalscorer of Champions League goals at the Johan Cruijff Arena with six goals (level with Zlatan Ibrahimovic). Cristiano Ronaldo has scored seven goals in his last four Champions League matches against Ajax, including a hat-trick for Real Madrid on his last visit to the Johan Cruijff Arena back in October 2012.